Crussis URBAN scooters are designed for hobby and sport-enthusiasts. Front 26 "and rear 20" wheel is cloaked to low rolling resistance tires from Czech manufacturer Mitas. The braking system consists of components TEKTRO with excellent braking effect. Handlebars and stem carry CRUSSIS logo. 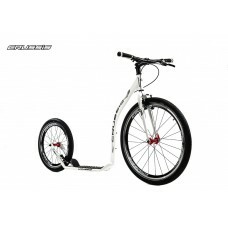 The scooter is designed as for children from 8 years old as for adults up to 6ft 7in. URBAN kick scooters have sporting ambitions. They fit into the city, asphalt or gravel paths. The short wheelbase ensures excellent drive-ability and maneuverability. Emphasis was placed on a stiffness of the frame that is reinforced in the most stressed parts of the kick scooter. The result of this is that the rebound power is concentrated only on the ride onwards without undesirable energy loss. The scooter is fast and perfectly controllable even at higher speeds. The design is playful and accurately captures what CRUSSIS kick scooters are about – Enjoy the Movement. Please provide a contact number with your order.This is for the benefit of the courier.